Conference Series LLC Ltd invites all the participants from all over the world to attend "20th World Congress on Analytical and Bioanalytical Chemistry " during December 09-10, 2019 in Kuala Lumpur, Malaysia which includes prompt keynote presentations, Oral talks, Poster presentations and Exhibitions. This conference aims to provide a forum for researchers from various areas of chemical industry, food analysis, pharmacogenomics research, DNA analysis, method development and validation by providing a platform for critical analysis of new data, scope for analytic chemist and to share latest cutting-edge research findings and results about all aspects of Bioanalytical and analytical chemistry. Analytika Conference provides the research works of Analytical chemistry expertise from various scientific backgrounds and the same can be perceived by young researchers and students. Analytical Techniques Conferences mainly aims to promulgate knowledge in Analytical & Bio analytical Techniques, Chromatography, Separation Techniques, Mass Spectrometry and Spectroscopy. Both Pharmaceutical and Life science in course of research work and therefore Analytika 2019 would be a perfect venue to share and develop knowledge on key Analytical Techniques tools. Analytika 2019 focuses on all aspects concerned with the substances of which matter is composed, the investigation of their properties and reactions, and the use of such reactions to form new substances. The conference provides the research works of Analytical Chemistry expertise from various scientific backgrounds and the same can be perceived by young researchers and students. Analytika Conferences mainly aims to promulgate knowledge in Life Science Analysis and Industrial Analytical techniques. Both life sciences and Industrial sciences need Analytical and Bioanalytical Techniques in course of research work and therefore Analytika Meetings would be a perfect venue to share and develop knowledge on key Analysis tools. This session is representing wide variety of techniques used for analysis, from simple weighing Titrimetric, Chromatography and Spectroscopy to very advanced techniques using highly specialized instrumentation. The global Analytical market for advanced Techniques is Certain to reach USD $219.3 billion by 2020, a five-year compound annual growth rate (CAGR) of 1.1%, through 2020. 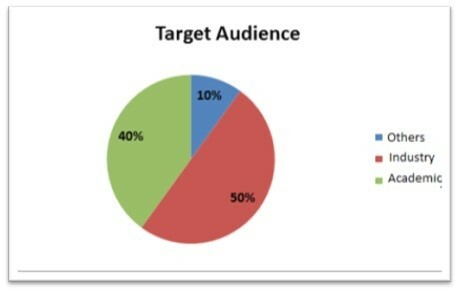 According to Present report by Grand View Research. This term of ‘Advanced Bio-analytical Techniques’ concerned with all Bioanalytical techniques in chemistry, biochemistry, biology, pharmaceutical and clinical sciences, environmental, forensic and materials sciences. Bioanalytical Chemistry may be a sub-division of Analytical Chemistry that covers the measuring of medicine, Proteins and de oxy ribonucleic acid in unnatural samples or concentrations. Bioanalytical Techniques and validation are utilized in the measuring and analysis of huge molecule medicine. This term is represent Bioanalytical technique of the recently developed subtle strategies that include: combined techniques like Chromatography, electrophoresis, biosensor, LC-MS, Spectroscopy and Ultrafast Spectroscopy, GC-MS and natural process strategies like HPLC. The global Bioanalytical market should reach $58.0 billion by 2020, growing at a compound annual growth rate (CAGR) of 3.8% from 2015 to 2020. This session of Clinical chemistry (also known as chemical pathology, clinical biochemistry or medical biochemistry) is the area of clinical pathology that is generally concerned with analysis of bodily fluids for diagnostic and therapeutic purposes. It is an applied form of biochemistry (not to be confused with medicinal chemistry, which involves basic research for drug development). This term is representing the technique of Clinical Chemistry, Clinical endocrinology, Clinical Toxicology, Therapeutic Drug Monitoring, Blood and Urinalysis. The global Clinical technique market to increase from $5.5 billion in 2016 to nearly $19.5 billion in 2021 at a compound annual growth rate (CAGR) of 28.8% for 2016-2021. This track is representing Pharmacological activity DNA Analysis, Process analytical technology Electrochemical Method, Human drug metabolism Standard of technique. 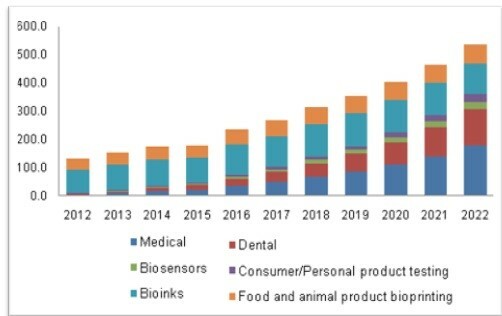 The global Pharmaceutical market is expected to grow at a five-year compound annual growth rate (CAGR) of 7.9% from 2016 to 2021, increasing to $5.5 billion in 2021. This track of Liquid chromatography–mass spectrometry (LC-MS) is an analytical chemistry technique that combines the physical separation capabilities of liquid chromatography (or HPLC) with the mass analysis capabilities of mass spectrometry (MS). Coupled chromatography - MS systems are popular in chemical analysis because the individual capabilities of each technique are enhanced synergistically. Therefore, LC-MS may be applied in a wide range of sectors including biotechnology, environment monitoring, food processing, and pharmaceutical, agrochemical, and cosmetic industries. This track is representing HPLC and application, Mass spectrometry for biomedical application, Advances in sample preparation, Electrospray ionization. The global chromatography instruments market is expected to reach USD 10.99 Billion by 2022 from USD 7.86 Billion in 2017, at a CAGR of 6.9%. This session of Diagnostic assays and test kits. Immune chromatographic Assays in addition cited as Lateral Flow Tests or just Strip Tests unit of measurement immunoassays performed on an easy to use strip format. Amount of your real time quantitative PCR is incredibly correct and fewer effortful than current quantitative PCR ways in which. Needs relatively bit of sample, Adequate level of sensitivity, easy manufacture in large scale, Stability of the last word product at temperature (shelf life), β-D-Glucan as a Diagnostics Adjunct for Invasive Fungal Infections: Validation and drug development, and Performance in Patients with Acute Myelogenous blood cancer. This track is representing Evaluation of HIV/ AIDS diagnostics kits, Validation of a commercial real time PCR kits, Development and validation of diagnostic tests. The global market for test kits and DNA vaccines was valued at $243.7 million in 2013 and is expected to increase to $305.3 million in 2014, and further to $2.7 billion by 2019, a compound annual growth rate (CAGR) of 54.8% over the five-year period from 2014 through 2019. This track is representing Such separation techniques include Filtration, Crystallization, Sedimentation or Evaporation. 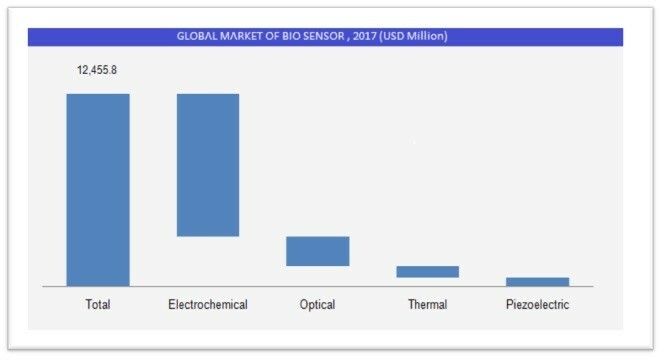 The global market for Biosensors reached $110.4 billion and $123.5 billion in 2015 and 2016, respectively. This market is expected to increase from nearly $138.8 billion in 2017 to nearly $240.3 billion in 2022 at a compound annual growth rate (CAGR) of 11.8% for 2017-2022. The Thermal analysis market is estimated to be valued at USD 4.04 Billion in 2017, and is projected to reach USD 5.99 Billion by 2022, at a CAGR of 8.2% from 2017 to 2022. In this track of ‘Analytika 2019’ will be discussed about Chemical Analysis of Food : Techniques and Applications reviews new technology and challenges in food analysis from multiple perspectives: a review of novel technologies being used in food analysis (solid phase extraction ,HPLC, enzymatic method), an in-depth analysis of several specific approaches. These analytical procedures are used to provide information about a wide variety of different characteristics of foods, including their composition, structure, physicochemical properties and sensory attributes. The food automation market was valued at USD 8.22 Billion in 2016. It is projected to grow at a CAGR of 6.90% from 2017, to reach 12.26 Billion by 2022. In this track of Analytika 2019 will be discuss about Novel approaches to Analytical and Bioanalytical Techniques. Analytical Chemistry maintenance of a desired level of quality in an exceedingly service or product, particularly by means that of attention to each stage of the method of delivery or production. Bioanalytical Chemistry could be a sub-division of Analytical Chemistry that covers the measuring of medicine, Ion sensors, Proteins and DNA Sequences in unnatural samples or concentrations. Correct quantification of the drug samples is extremely very important for several scientific endeavors which cannot hinder the result.This track is representing Such Ion sensors, Proteins and DNA Sequences in unnatural samples, Method development and validation reports. This Term of Analytika will be discuss about issues and safety challenges. Liquid analysis may be a key analytical technique that mixes the physical separation capabilities of liquid action with the mass spectrometry analysis capabilities of spectrometry analysis. LC-MS system is employed for fast and mass directed purification of natural-products extracts and new molecular entities necessary to food, pharmaceutical, agrochemical and different industries. LC-MS is sometimes utilized in drug development research at many different stages, impurity identification, quantitative Bioanalysis, and control. This track is representing Such current quality and regulatory issues associates with traditional medicine, overview of LC-MS bioanalysis related regulations. This track of congress will be discussed about method, development and validation. Analytical method development and validation are the continuous and inter-dependent task associated with the research and development, quality control and quality assurance departments. Analytical procedures play a critical role in equivalence and risk assessment, management. It helps in establishment of product-specific acceptance criteria and stability of results. Validation should demonstrate that the analytical procedure is suitable for its intended purpose. Design of experiment is a powerful tool for the method characterization and validation. This track is representing Such development, Standard of technique, stability, Accuracy of techniques. NMR analysis is used in separation of complex and natural samples. Recent advances in Mass Chemical Analysis area unit facultative improved analysis of endogenous metabolites. Here we have a tendency to discuss many problems relevant to developing High-Performance Liquid Chromatography, ion chromatography, FTIR ,XRF, electro spray ionization, mass chemical analysis ways for targeted metabolomics (i.e., menstruation of dozens to many specific metabolites). Lab-on-a-chip devices area unit a set of MEMS instruments and infrequently indicated by "Micro Total Analysis Systems" (µTAS) still. This track is representing such FTIR (Fourier Transform Infrared Analysis), XRF (X-Ray Fluorescence Spectrometry), CP-OES (Inductively Coupled Plasma Optical Emission Spectroscopy), IC (Ion Chromatography). 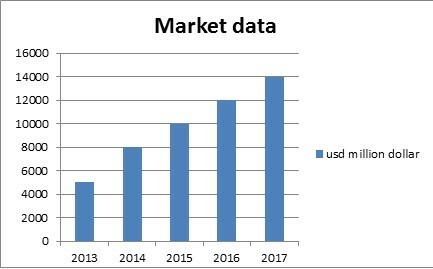 The NMR analysis market is estimated to be valued at USD 4.04 Billion in 2017, and is projected to reach USD 5.99 Billion by 2022, at a CAGR of 8.2% from 2017 to 2022. Analytical chemists use their knowledge of chemistry, instrumentation, computers, and statistics to solve problems in almost all areas of chemistry and for all kinds of industries. For example, their measurements are used to assure the safety and quality of food, pharmaceuticals, and water; to assure compliance with environmental and other regulations; to support the legal process; to help physicians diagnose diseases; and to provide measurements and documentation essential to trade and commerce. This track is representing Scope for Analytical Chemist Such as Quality control, Production officer, Drug formulation and development, chemical or forensic analysis, Process development. 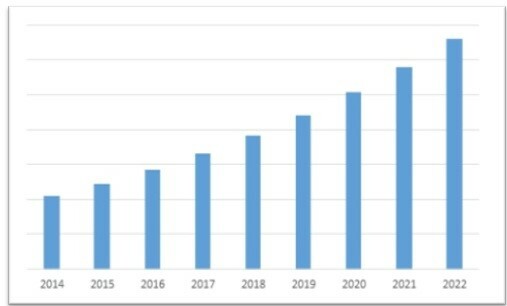 The retail analytics market is expected to grow from USD 3.14 Billion in 2016 to USD 8.64 Billion by 2022, at a Compound Annual Growth Rate (CAGR) of 19.7%. This track is representing Goal of analytical techniques like Establish the identity and chemical parameters of a substance, kinetic rate profile, Establish its physical characteristics, compatibility with common excipients. International Conference on Analytical and Bio analytical Techniques October 31- November 01, 2018 Columbus, Ohio, USA. 19th World Conference on Chromatography & Spectrometry March 20-21, 2019 New York, USA. 19th Global Chemistry Conference March 20-21, 2019 New York, USA. 9th International Conference and Exhibition on Spectroscopy and Analytical Techniques April 17-18, 2019 Osaka, Japan. 10th International Conference on Chemistry May 09-10, 2019 Amsterdam, Netherlands. 8th World Congress on Mass Spectrometry June 10-11, 2019 Edinburgh, Scotland. 10th International conference and Expo on Separation Techniques July 30-31, 2019 Amsterdam, Netherlands. 8th Global Congress on Mass Spectrometry August 16-17, 2019 Tokyo, Japan. Analytika 2019 aims to bring together leading academic scientists, researchers and research scholars to exchange and share their experiences and research results about all the latest research ideas in the field of ANALYTICAL AND BIOANALYTICAL CHEMISTRY . It also provides the chance for researchers, practitioners and educators to present and discuss the most recent innovations, trends, and concerns, practical challenges encountered, and the solutions adopted in the fields. The global market for advanced analytics totaled $207.4 billion in 2015, and should total nearly $219.3 billion by 2020, a five-year compound annual growth rate (CAGR) of 1.1%, through 2020.
art compound annual growth rate (CAGR) of 10.8%, to reach nearly $53.8 billion in 2021. The of bio photonics to encompass the application of light and other forms of radiant energy, ranging from visible range (e.g., far infrared at around 100 microns) to X-ray (e.g., hard X-rays), primarily to life sciences and medicine. Analytical techniques remain un-developed, interest in the field is blasting. The U.S. government conveyed more than a billion dollars to analytical technique inquire about in 2005 to discover new advancements in analytical techniques. The global market for advanced analytics totaled $207.4 billion in 2015, and should total nearly $219.3 billion by 2020, a five-year compound annual growth rate (CAGR) of 1.1%, through 2020. The global market for Bioanalytical life sciences tools and reagents reached $45.9 billion in 2014 and $48.2 billion in 2015. The market should reach $58.0 billion by 2020, growing at a compound annual growth rate (CAGR) of 3.8% from 2015 to 2020. 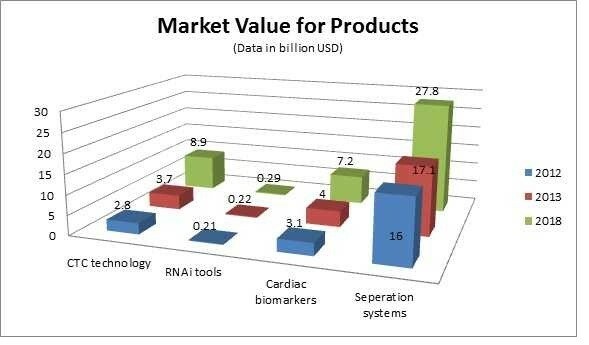 The global market for Bioanalytical (natural fatty acids) was valued at $7.2 billion in 2011 and $6.8 billion in 2012. This market is projected to reach $13 billion by 2017, growing at a compound annual growth rate (CAGR) of 13.6% through the five–year forecast period of 2012 through 2017. The global market of Pharmaceutical for antibody drug conjugates was valued at $1.3 billion in 2016. The market should reach $4.2 billion by 2022, growing at a compound annual growth rate (CAGR) of 25.5% from 2016 to 2022. The global market for single-use technology reached $2.7 billion in 2016. The market should reach over $4.3 billion by 2022, growing at a compound annual growth rate (CAGR) of 10.1% from 2016 to 2022. The urine testing market totaled $49.5 billion in 2015 and reached to nearly $50 billion in 2016 This market is expected to grow $56.6 billion in 2019, with a compound annual growth rate (CAGR) of 2.6%. The global market for Separation technique (membranes) used in liquid and gas separations should reach $4.6 billion by 2021 from $3.4 billion in 2016 at a compound annual growth rate (CAGR) of 6.2%, from 2016 to 2021. The global cell and tissue analysis products market reached $10.8 billion in 2015 and should reach nearly $12.5 billion by 2020, with a compound annual growth rate (CAGR) of 2.8% through 2020. Conference Series LLC Ltd organized 19th World Congress on Analytical & Bioanalytical Chemistry during December 09-10, 2019 at Singapore. Eminent Scientists, researchers, business professionals and scholar students were participated during this prestigious conference. With the support and steerage of Organizing Committee Members, Editorial Board Members and amaze displays of all participants this outstanding summit became additional spectacular. The theme of the conference “Novel Approaches to analytical and Bioanalytical Techniques” was a great success where eminent keynote speakers from various reputed institutions made their resplendent presence and addressed the gathering. Analytika 2018 witnessed an amalgamation of peerless speakers who enlightened the crowd with their knowledge and confabulated on various new-fangled topics related to the field of Analytical & Bioanalytical sciences. Conference series LLC Ltd expresses its gratitude to the conference Moderator Dr. M.V. Reddy for taking up the responsibility to coordinate during the sessions. We are indebted to your support. Conference Series LLC Ltd would like to convey a great appreciation to following honorable guests and keynote. Conference Series LLC Ltd has taken the privilege of felicitating Analytika 2018 Organizing Committee, Editorial Board Members, Honorable guests and Keynote Speakers who supported for the success of this event. With property excitement for success of this conference it's glad to announce next annual meeting 20th World Conference on Analytical & Bioanalytical Chemistry conference during December 09-10, 2019 at Kuala Lumpur, Malaysia.